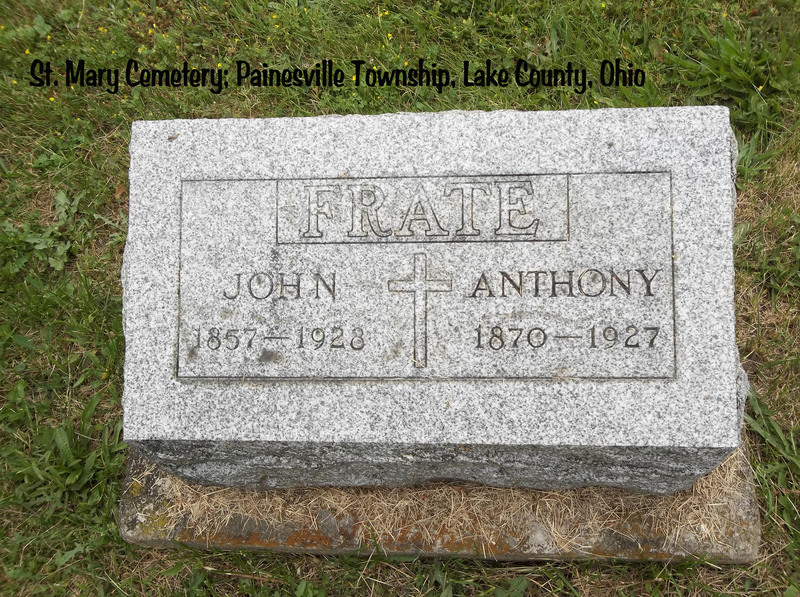 Antonio Frate first appears at Painesville, Lake County, Ohio, in 1916. Antonio and his wife, Maria Silvestro, moved from Cleveland to Painesville. In America, Antonio Frate was known Anthony Frate. Antonio Frate, son of Teodoro Frate and Gaeglbelmina DeFranco, was born on Monday, April 3, 1871, at Rionero Sannitico, Italy. Antonio was married to Maria Silvestro, daughter of Medio Silvestro and Angeline Riqiuta. 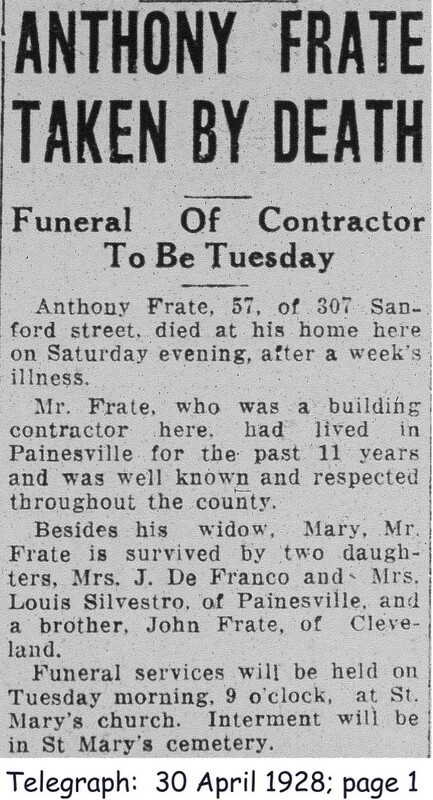 Antonio died on April 28, 1928, at 307 Sanford Street, Painesville, Lake County, Ohio, at age 57, of nephritis. His body was interred at St. Mary Cemetery at Painesville Township, Lake County, Ohio. Antonio Frate, age 22, first immigrated to the United States, on May 22, 1893. His wife, Maria, joined him in America in 1897. Antonio was probably living at Toledo, Ohio, at the time. Mr. Frate, and his family were enumerated for the 1900 Census of the United States, on June 9, 1900, living at Woodland Hills Avenue, Cleveland, Cuyahoga County, Ohio. At the time of death, Antonio resided at 307 Richmond Street, Painesville, Lake County, Ohio. Mr. Frate was a building contractor. Antonio Frate’s brother, Giovanni Frate, was also a Painesville Italian. 1. Minnie Julia Frate was born on Thursday, October 28, 1897, at Toledo, Lucas County, Ohio. (Minnie may have been born in Italy.) Minnie married Giuseppe DiFranco, son of Carmen DiFranco and Lucia DiVincenzo, on May 28, 1914, at Cleveland, Cuyahoga County, Ohio. She Julia died on August 16, 1949, at Lake County Memorial Hospital, Painesville, Lake County, Ohio, at age 51, of a cerebral homorrhage. Her body was interred at St. Mary Cemetery at Painesville Township, Lake County, Ohio. 2. Josephine Peppina Frate was born on Thursday, January 5, 1899, at Toledo, Lucas County, Ohio. Josephine married Lucian Silvestro, son of Domenico Angelina Silvestro, on August 16, 1920, at Lake County, Ohio. Josephine died in 1978. Her body was interred at St. Mary Cemetery at Painesville Township, Lake County, Ohio.